Up to a third of the cars clogging the roads in a given downtown area are people looking for parking. You’ve done it yourself, circling the block four times, driving past the restaurant that might or might not hold the reservation you’re already late for, praying somebody leaves so you can grab a spot at a meter. Parking structures are no better. What a waste of time for a human to have to find the nearest facility, drive there, helix up endless ramps, and then cruise the aisles. Quick, there’s a spot! No, damn, there’s a Mini hiding in there. Parking is a problem that engineers reckon self-driving cars can solve. Send the robot to find a space, after it drops you off at your destination. Summon it back later when you’re ready to leave. The fatal accident in Arizona this week, in which an Uber autonomous test vehicle killed a pedestrian pushing a bike across the street, highlights some of the dangers of robo-driving at regular speeds. But low-speed movement, with scanners running on full, in a fixed area, is a much safer way to apply the tech. Building owners could have high resolution maps made of their parking lots, geo-fence them, and designate them as no-human zones, so cars can do their thing. It’ll be just like dropping your car at a valet stand, except you don’t have to dig around for singles. More cars will fit into each lot: Because doors don’t need to be opened, the vehicles can squeeze tightly together. Jaguar Land Rover is starting tests of a self-driving valet in the UK town of Milton Keynes, about and hour and a half north of London. A black Range Rover Sport with some fancy graphics on the side and a few small sensors on a roof-rack, is cruising the streets and slotting into parking spaces. For now, a safety driver is always at the wheel. 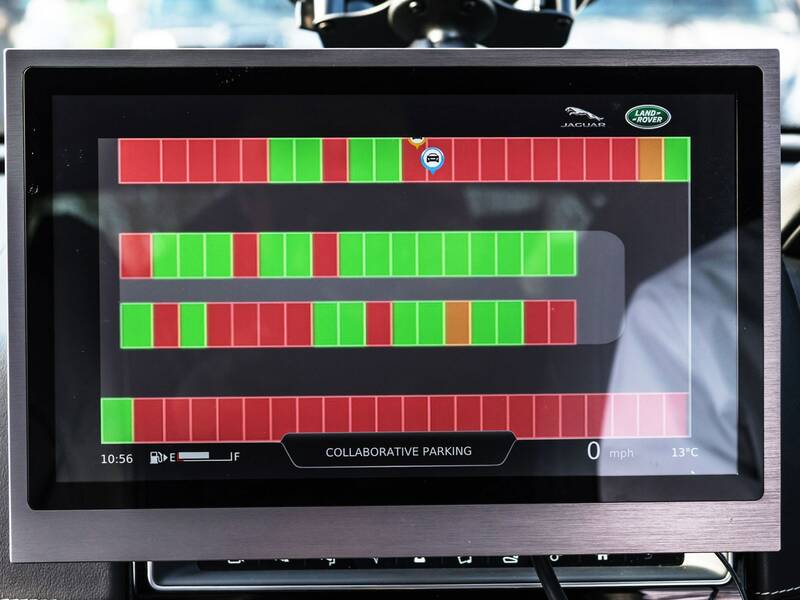 JLR sees tricks like this as a useful way to introduce drivers to the idea of buying autonomous vehicles. “We’re going to have to look for features that people say they really want and introduce them gradually,” says Imogen Pierce, who handles global technology communications for the company. So even if a buyer isn’t ready to cede all control to a computer, she may be keen to buy a car that takes over the more mundane parts of driving. Milton Keynes is one of the bases for the UK Autodrive Project, a three year trial that started in November 2015. JLR, Ford, and Tata Motors have all provided vehicles that are equipped with the usual self-driving suite of laser and other scanners. Vehicle-to-vehicle communications means they can talk to each other and detect signals broadcast by traffic lights or other infrastructure. A fleet of 40 autonomous white pods is also being let loose on the city to figure out ways to combine different transit options. (Park outside the city and transfer into a smaller pod to get to the congested center, for example.) And the robots are having to deal with something they wouldn’t come across much in the US. “There are so many roundabouts it really robustly tests the demonstration,” says Pierce. Ford is using the data gathered and shared by the vehicles in the trial for something it’s calling Collaborative Parking, which could help humans even before the robots take over. As soon as a driver approaches a parking lot, a screen in the car displays a diagram with spots marked red and green, so she can head directly to an open space. The company says its research shows that drivers spend at least a full day each year looking for somewhere to stop. Collaborative parking works by using data collected by the parking sensors on other cars that have already circled the lot and sharing it with newcomers. The consortium isn’t alone in trying to solve the misery of parking in congested cities. Audi demonstrated a robot valetas far back as 2013, at CES in Las Vegas, and the city of West Hollywood, California, has built a parking garage that uses small insect-like robots to lift cars and move them to open spaces, with no driver inside. Tesla’s Model S and X come with a summon feature, which a driver can use to remote-control the car from outside, moving it forwards and backwards into tight spaces, using either the key, a phone, or a smartwatch. A smarter system that can circle, find a space, and park, should be possible with the cameras Tesla is installing on the outside of all its cars, and would be a step toward the full self-driving that Elon Musk is promising. So far these demonstrations rely on expensive sensors, like lidar laser scanners, that aren’t installed on production vehicles, so it’ll be a few years before your car will park itself. But one day, “I was looking for parking,” will no longer cut it as an excuse for being late to dinner.